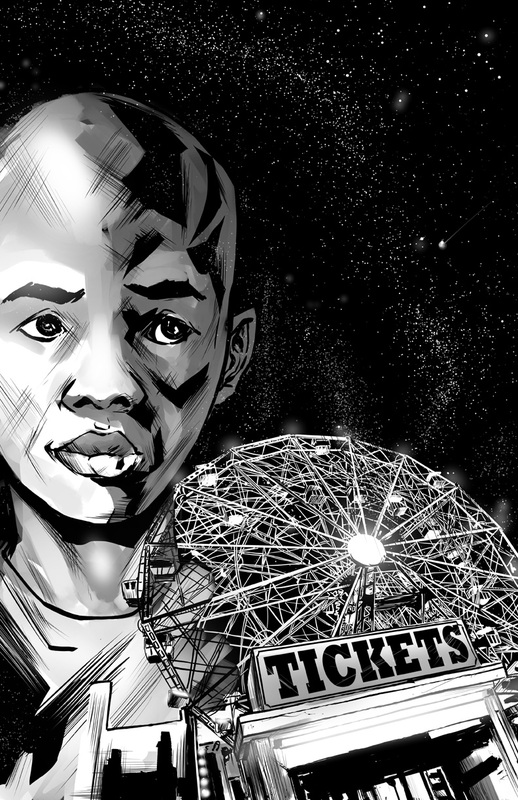 James was a black boy, lived in Harlem, and loved the stars in the sky – all twenty of them. You see, Harlem is in a huge city with lots of lights – pinkish street lights, flashing signs, neon martini glasses. And of course every taxi has lights in front, and in back, and even on top. And when there are lots of lights all over, it is hard to see the stars. But James loved the twenty stars that he could see from the window in the kitchen by the fire escape. One warm night, while his parents were in bed, James snuck into the kitchen even though it was way past his bedtime. He watched the skies for hours, and the stars on one side of the sky had moved from behind the payday loan sign to just above the roof of the warehouse across the street. To get a better look, James opened up the kitchen window all the way. He did this slowly, so that the window would not make noise, because he would be in trouble if his parents heard him, for they had a rule that James was not allowed to open the windows any wider than his parents had left them. His parents were afraid, especially when James was smaller, that he would fall out. “Technically, I can’t fall out this window anyway, because the fire escape is there to catch me,” James thought. James always used big words like “technically” because he was bright; in third grade he wrote an essay about Derek Jeter that his teacher liked so much that she hung it on the bulletin board by sticking a pin through it. All the kids could see that the teacher wrote “A+” on the front page. In a jiffy, James was standing on the fire escape next to his mother’s red geraniums. The man was crouching outside the apartment above, and held a screwdriver in his hand. “My occupation requires that I spend a lot of time on the roofs of apartment buildings, and I work the night shift. If you go on the roof, you’ll see even more stars,” said the man. James went to bed and dreamt about walking on the moon, and the moon was all sandy. The next day, if you saw him, you would have said that James looked puzzled; and James was puzzled. James thought and thought all day of a plan that would allow him to get to the roof of his building in the middle of the night, without waking up his parents. But there were four locks on the front door, and the locks made clicky, loud metal sounds when they were opened; he knew his parents would come running once they heard the sound of the locks, and on top of all that, the front door squeaked when you opened it. How will James get to the roof without waking up his parents? That night, James went out onto the fire escape again. He heard a noise below him, and he saw the same man with the screwdriver outside the window of the apartment below; this time, the man also had a flashlight. And James climbed up the fire escape quietly, and soon he was on the roof. And for about an hour, James was a watcher of the skies. Then he yawned, crawled back down the fire escape, and went to bed. The next evening, James ate his supper with his mother in the kitchen. “I’d like to touch the stars,” James said. “If I could reach the stars, then I could touch them. If it takes me one minute to touch each star, then I can get the whole thing done in a thousand minutes. It’s summer vacation now, and I’ve got the time. If I wait until school starts, I’ll never have the time,” James said. “There are a billion stars, not a thousand, and no boy has ever touched a single one,” said James’s mother. This story really begins once James’s mother said the word “billion.” James was amazed. Could it be true? So many stars? That night, James took out a pen and began doodling on a piece of looseleaf paper. He drew stars, he drew the moon, he wrote words and phrases, like “starlight,” and “the moon has mountains,” and “Pluto lives.” The doodling went on for days until, one night, James made a decision to find someone who could help him touch the stars. After his parents were asleep, James put two apples and a bottled water in his backpack, climbed down the fire escape and walked down the block. That day it had been quite hot, and the kids on the block had turned on the fire hydrant, which had a sprinkler on it, and played in the sprinkly water all day. There was a large puddle in front of the fire plug. “They visit me every night. Just take a look,” said the puddle. James looked hard at the surface of the puddle, but he only saw three stars shimmering faintly, and his mother had mentioned a billion, so he kept walking. He passed a bar with an open door and a strong smell; the neon martini in the window winked into the night. James headed for the train station. A man was sitting on the pavement in front of a sign that said “125th St. Station”; the man held a bottle. “The stars visit this bottle every night,” said the man, who held the bottle out towards James. “Here, have a sip,” the man said. Just then, a policeman walked by, swinging a nightstick. The policeman poked the man with the bottle with a nightstick and said to him: “You look service-resistant. Get out of here.” The man fled with his bottle. “And what are you doing out on the street?” the policeman said to James. “I’m trying to figure out how to reach the stars,” said James. With that, the policeman ordered James to turn around, and the policeman frisked James and looked through his backpack. “If you’re still here in sixty seconds, I’m busting you,” said the policeman. James ran down the stairs to the subway. There were people going through a turnstile to the train; each person went through the turnstile by swiping a little card. Nearby was a booth surrounded by glass. James asked the man in the booth if there was a train that went all the way downtown. The man said “yes” and asked for $1.75. “Can I give it to you on my birthday?” asked James. “Now or never,” said the man in the booth. James thought that the man was saying that James would never reach the stars, and this upset James very much. So James bit his lip, and looked around the train station, and ran towards the turnstiles and jumped over one. Then he ran towards the train, which was rolling in at that moment. James sat down on a seat. All of the seats were orange and most of them were empty. He took the bottled water out of his backpack and took a sip. “Reaching the stars is hard work,” James said to himself. Just then, a man with a bow tie sat down right next to James. “Are you lost?” the man with the bow tie asked. “I don’t think so, but thanks anyway,” said James, and the man with the bow tie got off the train at the next stop. James stayed on the train, and the train made many stops. At every stop, the doors opened and a man’s voice said over the loudspeaker: “Watch the closing doors.” James read every sign at every train-stop, for each station had its own name. One after the other, the station signs passed by, but not one sign said “All The Way Downtown” and that was the sign that James was waiting for. And the hours went by; at home, James’s parents slept, but the red geranium worried. And just like that, the martini glass went to the train station, where he bumped into the red geranium. And the red geranium and the martini glass got on the train. By that time, James had been on the train for a long time and had eaten both apples and finished the water. And James walked up the stairs into the night. There were people around, and all of them seemed to know where they were going. But James did not know where he was going, so he walked up to a man with a black leather jacket who was leaning against a very fancy car under a streetlight and smoking a cigarette. So James kept walking along the pavement in the dark; street after street, street after street. Then, all of a sudden, James was walking on wood! And he could smell the sea! And it was all breezy and fine! For James had found the pier. “This must be all the way downtown, because I’ve never seen so many stars,” said James, and then he saw stairs from the pier down to the beach, and he walked down the stairs, and then he walked along the sand. It was so quiet, but the sea had a gentle rhythm of its own, and James walked down to the water’s edge. James looked up and saw a billion stars. He stood on his toes and reached his hands up, up, up. And James sat on the beach and counted the stars, but he fell asleep on the beach just as the stars were fading and morning began. He dreamt that he was doodling and ran out of ink. The martini glass tapped James on the shoulder. That very night, James slept soundly in his bed, and his parents never learned that he had snuck out of the apartment. Also that very night, the red geranium bloomed and the martini glass twinkled like a good star.